Scott Collins and his family returned to the southern edge of Marathon Key to find their home devastated. At the Sunshine Key RV Resort, trailers are turned over and debris is strewn around. Gayzel Collins works to salvage some of the kids' belongings and begin the cleanup process. Seaweed is mixed with toys and belongings in the Collins family's home. (Left) The door of the Collinses' home has a spray-painted warning to would-be looters. (Right) A family photo turned up in the mess. Laura Welliver walks through her home, surveying the damage. Collins doesn't plan to leave, but he does hope to build a concrete house that will withstand future storms. 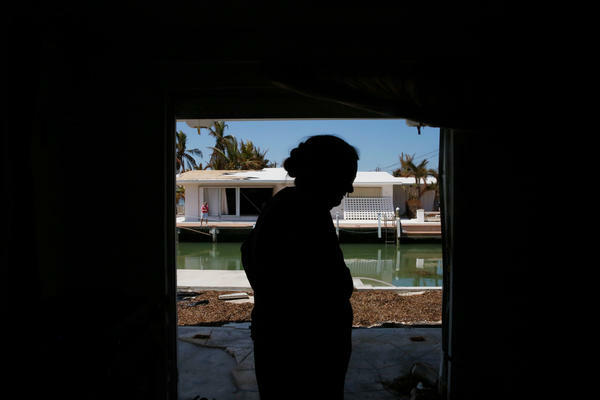 When Scott Collins and his family returned home to the southern edge of Marathon Key, they found their home — with its million-dollar view just steps away from the turquoise blue southern Atlantic — devastated. He, his wife and two daughters evacuated to Orlando before Irma struck. The aluminum hurricane shutters covering the house's doors and windows facing the ocean had been crushed and peeled away by the powerful storm surge. "The back wall gave out into the Florida room here," Collins says. Furniture, household items and the children's toys are against the walls, mixed with seaweed. "Everything was jammed into the front of the house in just one giant pile." Even a granite counter top from the kitchen was washed into another room by the storm surge. Now, Collins says, it's too heavy for him to move. Collins works as a fishing guide, specializing in fly fishing for tarpon and bonefish. He took his boat with him when he evacuated, but he lost a lot of fishing gear in the storm. "All this fishing stuff, it doesn't bother me," he says. "It's more painful when I see my kids' stuff and personal items that have just been soaked and ruined. That gets to me more." They don't think they've been looted. Perhaps a spray-painted sign across their front door reading "Looters Will Be Shot" helped. Although, Collins adds, there's not really anything to take, unless you really dig in the muck. Several family members have come down to help, and now that cell service is back, those who aren't here have been "blowing up" their phones with concern. Collins' brother-in-law, Josh, is here, helping mom Gayzel through the painful task of trying to salvage her 9-year-old daughter Addison's room. Amid the destruction in the room, the white letters that spell her name still hang with clean pink ribbon on the wall. 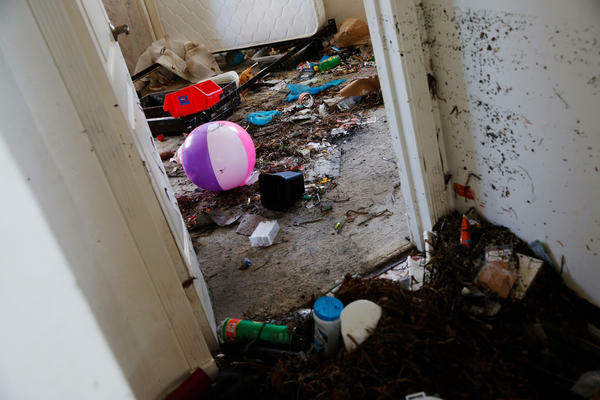 Collins says they plan to spend the foreseeable future sorting through the mixture of debris and belongings by hand — clearing what they can — and hoping to stave off the inevitable corrosion from the items' extended "bath" in saltwater. Most of Collins' neighbors also have damage, though only a few have returned to inspect. Laura Welliver, who lives next door, is in a good mood as she walks us through her house. She points out some dead flowers in a vase on the kitchen counter. They were freshly cut when she evacuated last week, and — despite their color — they seem to be the most intact thing in the room. On Facebook, she posted photos of the damage with the caption: "This is the new design of our home. Our free flowing kitchen, our open air living room. Fully furnished with seaweed." "I can make jokes," she says, "because I've already had my good, long cry." Local and state officials are encouraging residents not to return to the Keys until the infrastructure and services are ready for them. Florida Gov. Rick Scott says at least 10,000 Keys residents are now homeless. But over the weekend, Monroe County gave residents in the lower keys, including Marathon, the OK to come back. As of today, checkpoints to enter the Keys have been shut down, but officials are still asking vacationers and visitors to stay away. Marathon Key is without running water, sewer or power in many areas. But businesses like the Home Depot, Publix supermarket and some restaurants have reopened. At Brutus Seafood, manager Elise Mucha opened as soon as residents were allowed back. It was an unusual day, she said. There were no tourists, only locals, but she was doing a brisk business selling burgers and hogfish sandwiches. "It's been interesting. We have no computer or credit card," she said. "But we're making it work." Just across the bridge from Marathon, at the Sunshine Key RV Resort, the scene is less upbeat. Trailers are upended, many on their sides with windows and walls blown out. On Monday, the park was deserted except for one resident, Jandi Perez, who was working with friends on his trailer. He showed us the damage — a broken window, and the trailer had moved a few inches over on its blocks. He says he's planning on staying. 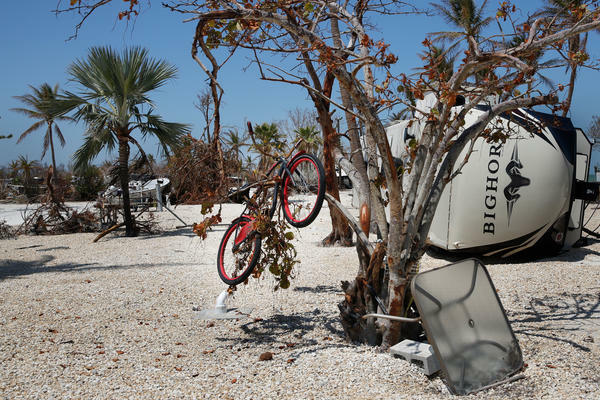 But throughout the lower Keys, mobile home parks like this one took severe damage. 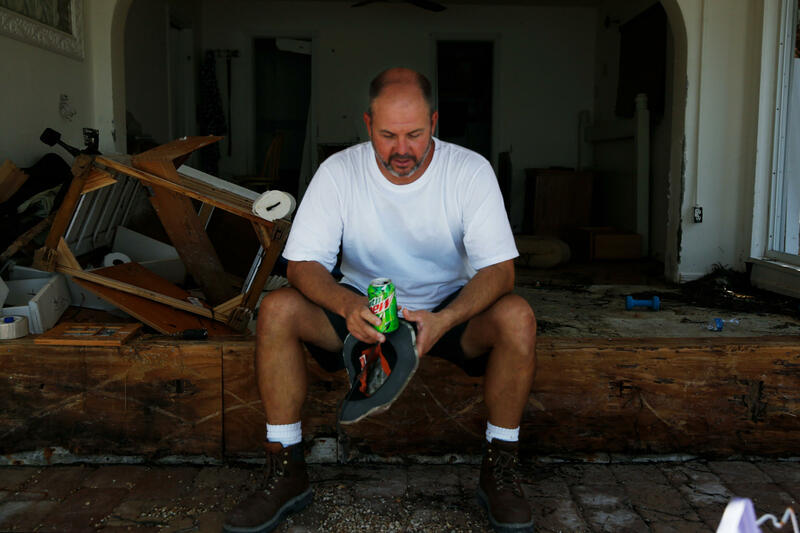 As we drive the Overseas Highway — the main road down the Keys — piles of debris line the roadside — downed trees, patio furniture, freezers, ice machines, even Jet Skis covered in seaweed, carried over land when the surge washed over the island. Cleaning up the mess comes first, then replacing the signs and gas station canopies torn apart by the high winds. But rebuilding Marathon and other hard-hit areas in the Keys will take longer. While older, one-story homes took a lot of damage from the storm, most two-story concrete block houses constructed more recently were relatively unscathed — a testament to the updated Keys building code, one of the strictest in the nation. 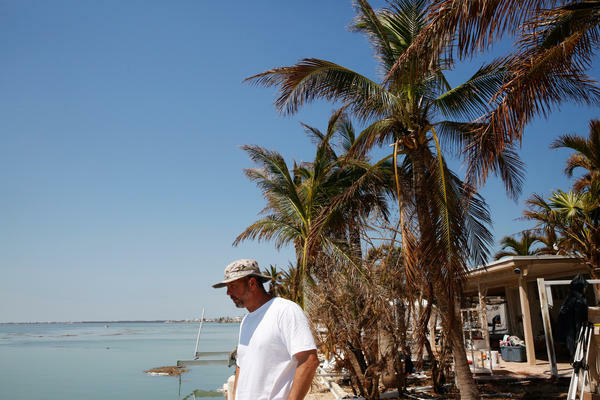 Scott Collins had plans before the hurricane to build one of those houses — just a few miles from the property devastated by Irma. As a fishing guide, he says his livelihood is here. He has no plans to leave. But he knows from past storms, many who work in the Keys' service economy may have little choice now but to go elsewhere. After the hurricane, many in the Keys now are asking whether rebuilt homes in communities like Marathon will be affordable to the people who work here. "They may not want to [leave] but they're not going to be able to stay here," Collins says. "Whatever they used to do before in the service industry, it's closed and they don't know when it will reopen. They may not have a place to live. They just can't recover. They've got to pull up and leave town."